BJP and its leaders are now investing more time telling people about all the social schemes that Modi government has launched. Soon after the news of the IAF’s strikes on terror camps in Balakot, Pakistan flashed on TV screens, most political experts were prompt to say that the BJP would immensely benefit from this. But like the Ayodhya issue, the “Punish Pakistan” rhetoric and talks about the so-called muscular policy in the wake of the Pulwama-Balakot episode will have limited appeal among voters. The overall voting pattern in most Indian states still remains rooted in caste and class considerations. The backroom boys of the BJP have been quick to realise this and are carrying out a course-correction. The party and its leaders are now investing more time telling people about the social schemes — like Ujjwala and the income support for farmers — the Narendra Modi government has launched in the last five years. Most advertisements have decided not to bank on the revenge-from-Pakistan narrative or the IAF strikes. The party has realised that posters with Wing Commander Abhinandan Varthaman may not go down well with people and are withdrawing them. Statements by the BJP leaders, like the ones made by former Karnataka chief minister B.S. Yeddyurappa and Gujarat state leader Bharat Pandya, linking the IAF strikes to the BJP winning more seats were disapproved even by the party cadre. The Pulwama terror attack, India’s response to it and the subsequent claims and counter-claims will still occupy some mind scape but they are unlikely to shape the common minimum programme of most political parties, and particularly the BJP. 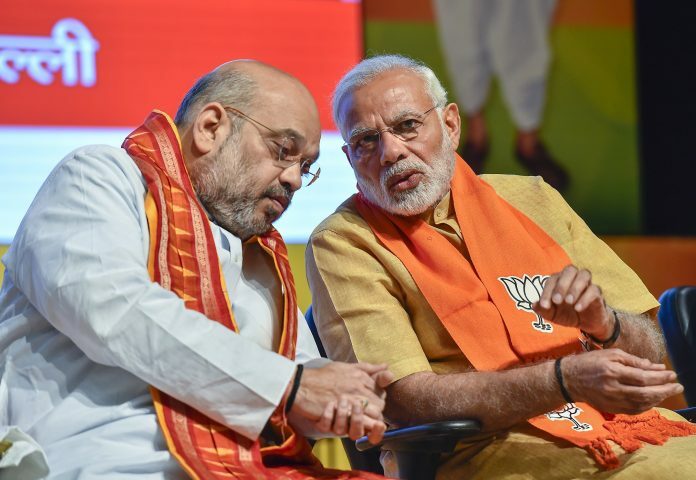 So, while Prime Minister Narendra Modi and BJP president Amit Shah may still make a political statement on Pulwama and Balakot here and there, the BJP has largely shifted its focus to more grassroots’ issues. Prime Minister Modi’s main focus in rallies and speeches now seems to be the schemes he has launched. The PM-KISAN scheme doled out the first set of instalments to farmers and Modi launched a pension scheme, the Pradhan Mantri Shram Yogi Maan Dhan Yojana, earlier this week. Perhaps the BJP has realised that it would not be wise to repeat the mistakes of 1999. After the Kargil War, the NDA government under Atal Bihari Vajpayee did come back to power but did not sweep the 1999 Lok Sabha elections as was expected. Meanwhile, the Congress has already re-set its poll campaign to “chowkidar chor hai” and the Rafale deal details. It accused the BJP and PM Modi of politicising the attacks, but the poll managers were quick to realise that this finger-pointing over Balakot won’t yield much. The Indian voter today is more mature and wants to know what parties are promising on jobs and growth. It is doubtful if parties will really benefit from a war hysteria manufactured in TV studios. One way to keep such issues out of the poll arena is if the Election Commission enforces the Model Code of Conduct (MCC) with immediate effect. It will prevent the Pulwama terror attack and the retaliatory air strikes on terror camps from becoming a part of the election narrative of either the ruling party or the opposition. The primary purpose of the election MCC is to ensure that the ruling party in a state or at the Centre should not be able to abuse official machinery for party purposes or derive undue advantage of being in power during elections. Thus, the MCC creates a level-playing field during elections. In fact, use of the Army in special circumstances is a subject of national security, which every political party should respect and avoid using as an election issue. The accusations and counter accusations on the actions of the armed forces not only vitiate the election atmosphere, but also seriously imperil national security. 1. Are the educated youth still looking for job and growth promises to be fulfilled by Modi govt if allowed a 2nd term? 2. Election Commision is set to announce poll dates today and if I am not wrong then they asked political parties spec BJP not to use services in poll campaign, just before announcing dates.Were they sleeping for last 12 days? There goes Abhinandan into the bin alongwith the Armed Forces! Use and throw is the Mantra of the Day! !